IMG_1580, originally uploaded by jahansell. The Salisbury Festival was a few weekends ago. 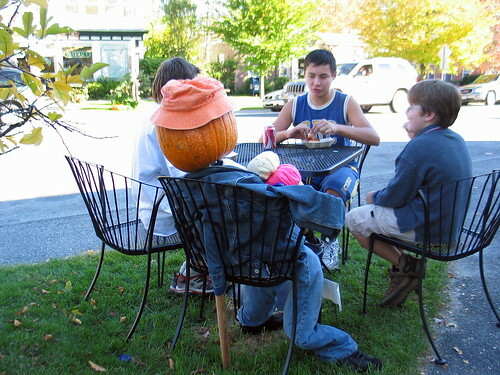 The scarecrow contest is always a highlight and this fine fellow made a pleasant addition to a group of friends snacking at Scoops ice cream shop. voici un compagnon pas trop genant. tres bonne photo, tres amusante. here a companion not too awkward. very good photograph, very amusing. Funny picture. Mr Pumpkin here is having a great time with them kids.